William Gibson or Steven Winterburn? Either way, what a revolutionary concept. 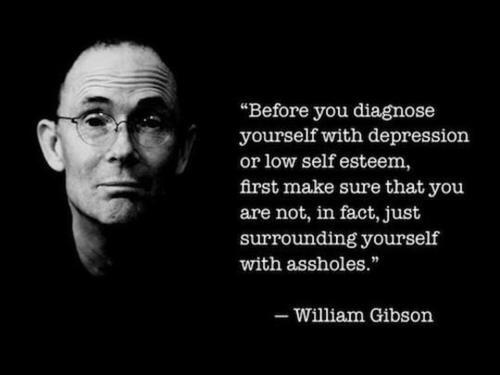 (This quotation has been attributed to both William Gibson and Steven Winterburn, although it seems the latter is the original author of the quotation). Keep in mind that assholes rarely think of themselves as that. More accurately, they are simply people like you and I who are struggling with a plethora of issues, fears, doubts, and neuroses, and they’re taking it out on you. You’re doing both yourself and them a favor by removing yourself from their company: you’re no longer the target of somebody’s batting practice; their anger no longer has an outside target and must now be examined. In a nation that is increasingly becoming hooked on all sorts of prescription drugs, it would behoove us to take a moment and actually attempt to work things out with that menacing figure known as “the other person” and within ourselves. If you have low self-esteem and/or are suffering from depression, chances are, you’ve had a lot of really nasty things said and done to you by other people throughout the course of your life. Think of it this way: if you were standing on a city street, and every passerby threw his or her trash at you (presumably thinking you were a human garbage can), would you remain standing there and just swallow some antidepressants in order to “deal” with the fact that you have garbage thrown at you? No. You’d move out of the way. Life isn’t about chasing a ball or “dealing” with a less than ideal situation and ingesting as many numbing chemical compounds as our bodies allow – in order to chase that ball or “deal” some more. We are part of a complex system, the very survival of which rests on relationships and interdependence. This means we don’t sit silently – drowning our sorrows in cheap wine and Xanax – while somebody else tramples all over us or others. We take action and leave, which sends a signal to the offender. Whether or not the offending person takes notice, much less decides to do something about it, is no longer your problem. All YOU can do is contribute in the most constructive and positive way you can to world.